This post will focus on one of the features of Decker’s Grammar which I have thoroughly appreciated. If you have flipped through the text, you will notice that there are a number of “side-bar” discussions. I have found these discussions, illustrations, and otherwise unnecessary material to be quite helpful. Some of this material clarifies terminology, provides alternate ways of learning material, or gives the reader a peak at matters they will investigate later in their Greek studies. For example, on pages 36–37 Decker provides the case endings for the first and second declensions. He encourages students to learn the endings with the connecting vowels, as if gives them the ability to pronounce the ending and thus learn it more effectively. Nevertheless, the side-bar chart on page 37 provides the student with the Technical Case Endings. Another example occurs on page 41 where Decker discusses what the difference is between a lexicon and a dictionary. The answer: they both mean the same thing; lexicon comes from the Greek word λεξικόν while dictionary comes from the Latin word dictionarium. 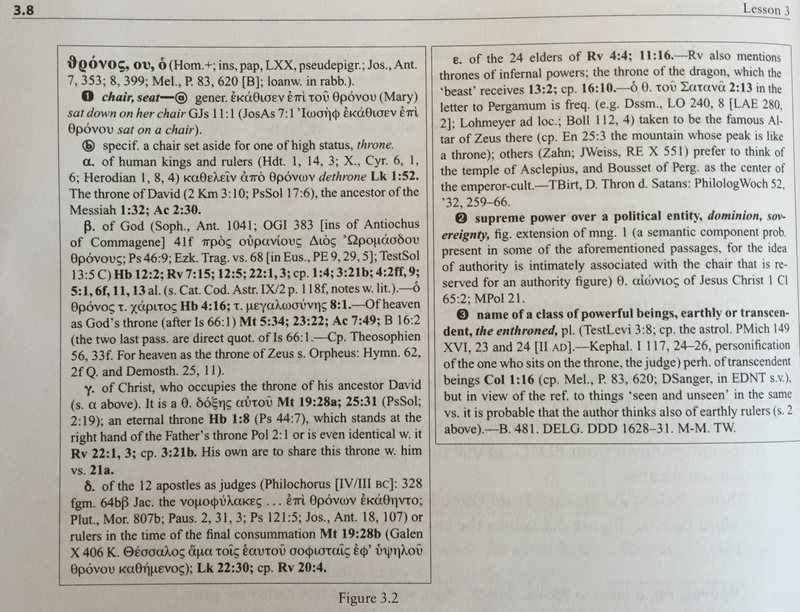 When teaching Greek, I’ve often photocopied a page out of each of the major lexicons and distributed them to the class so students would know what they were looking at when the time comes for them to use a lexicon regularly. Decker facilitates this by providing one for the student to become familiar with early in their studies (note that he returns to images of the lexicon throughout the grammar in order to teach new points about the various elements within each entry). 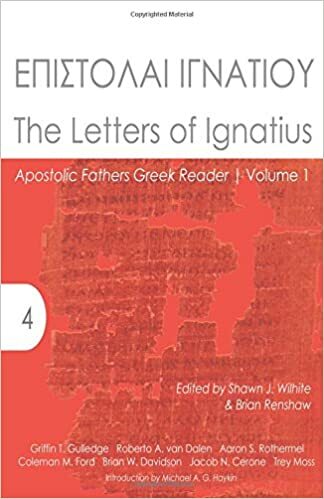 As students progress in the Grammar, they will encounter more and more exercises and extended translation sections from the Septuagint. Accordingly, some of the side-bar discussions interact with LXX grammatical peculiarities. 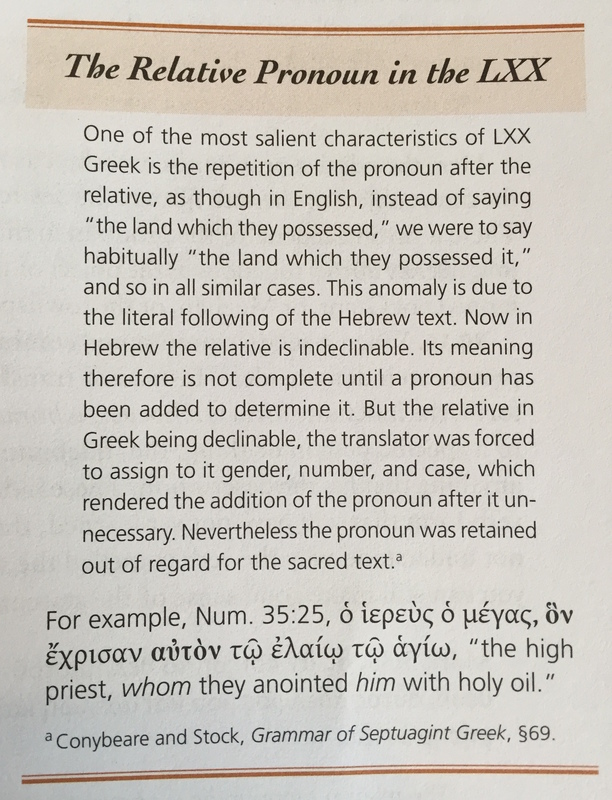 For instance, Decker provides a brief side bar discussion on relative pronouns in the LXX (p. 175). Figures I would like such things, you might think. After all, I did post on the LXX’s use of pleonastic pronouns just last Tuesday. For the diagramming enthusiast, Decker provides a new grammatical diagram for every new concept he introduces within the grammar. For students that learn visually, he provides plenty of charts and illustrations. One such illustration is A Visual Representation of Prepositions found on page 158. I could continue to include example after example, but that would become tiresome for me to write and cumbersome for you to read. So I will leave you with one last thought . . . While these features certainly contribute to the overwhelming size of the grammar, I have found them to be helpful in places that students will inevitably have questions. This entry was posted in Greek, Greek Resources and tagged Decker, Greek Grammar. Bookmark the permalink. As a layman, I’m very grateful for Decker’s grammar. I have a number of other introductory grammars (and 2nd year grammars) that I’ve sporadically and unsystematically studied over the past 2-3 years (Mounce, Black, Hewett, even Porter), but so far I prefer Decker’s over all of them. It is because he’s written this as a sort of teacher’s edition that the work helps me most. Because I can understand the pedagogical intent, I can better follow the train of thought. Now, hopefully, I’ll actually use Decker’s systematically!